Yes, I will not be blogging for about a month, so today’s post is the last you’ll see for a while here at OneLifeToEat. If you’re new to this blog or to Indian cooking, be sure to read the About page as well as some of my posts under Indian Cooking Basics, to understand how to start out with Indian cooking. Last week I shared the recipe for a dish that I made to use up some extra vegetables in my home that I didn’t want to waste. This week’s recipe is in the same spirit, and is also one that can be prepared in under 30 minutes. 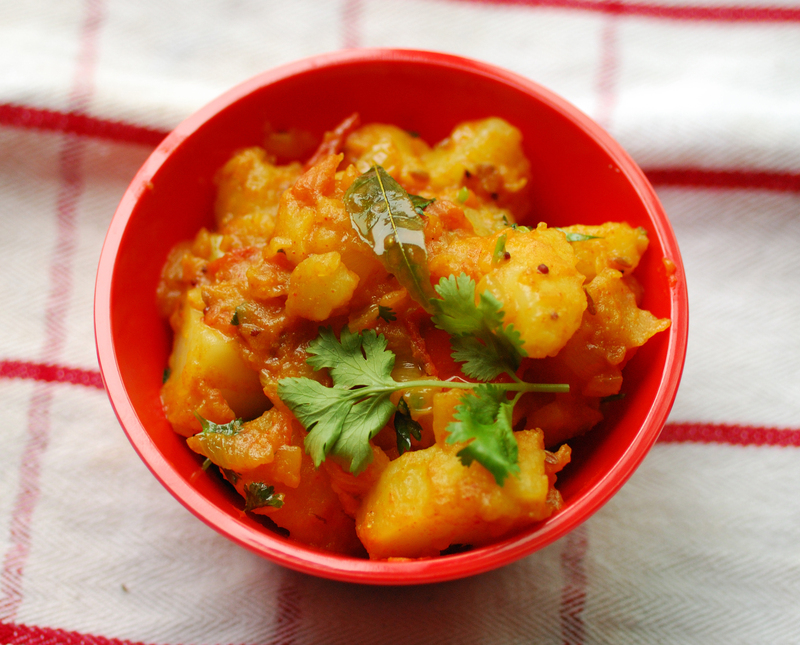 This easy potato curry is a staple in my home mainly because of its versatility. Flavored with simple, earthy ingredients such as cumin seeds, mustard seeds and curry leaves, it goes with almost any kind of bread, Indian or otherwise, any rice dish and can even be used to make a delicious, spicy sandwich, if you have a panini maker at home. This was one of the first vegetable preparations that I taught myself to make when I had just got married and needed to prepare something simple and idiot-proof for the first dinner with my husband in our tiny apartment. It seems like it happened a lifetime ago! Finally add the potatoes, envelop them in the spice mixture. 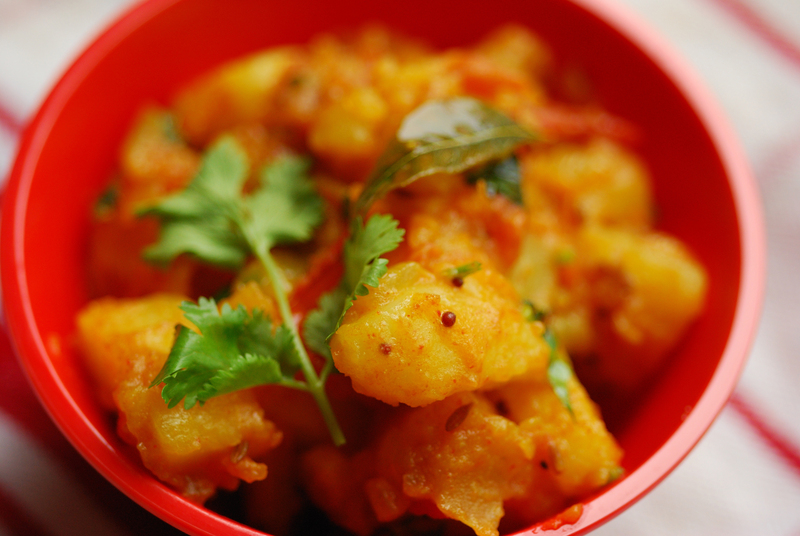 Garnish with chopped cilantro and lemon juice and serve hot with Roti’s or Rice and daal. I will sorely miss the blogging as well as interaction with all you wonderful readers and fellow bloggers while I am away. Hope to be in touch with some of you during my travels. Sabera – looks great. Why does the ketchup need to be chopped? What a fabulous recipe to leave us with…I am desperately in need of an idiot-proof recipe, so thank you for this. You will be sorely missed! Have a fantastic time on your trip and we’ll see you in January! I am in love with your blog! And I totally relate to the potato curry sandwiches.. We used to have a sandwich maker growing up, and you have no idea how many after-school snacks consisted of warm aloo sabzi sandwiches. This is almost the exact recipe my mom makes, and I’ve been trying to perfect it since (most Indian moms don’t have “recipes” so it’s been hard to emulate her!). I’ll have to give this one a try! Looks so good. I love anything with potato… and ketchup!